This April 9th, Pirate Party’s Mastodon instance will celebrate its first birthday ! Now is the time for us to evaluate this free and decentralized social network, while scandal hits Facebook. 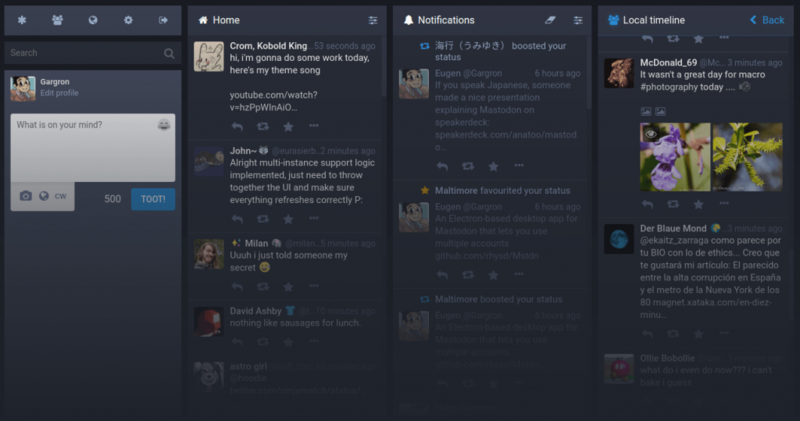 Mastodon is a micro blogging social network, in many ways similar to Twitter. That is, you have an account with which you can post short messages and people can follow you and you can follow them. The number of characters is limited to 500. Mastodon has several timelines. There’s a home-timeline where you can see the posts of the people you follow, a local timeline that shows all public posts from people on your instance, and the federated timeline. The federated timeline consists of all public posts that are known on your instance. This means posts from your own instance, and from the people outside your instance that you or anyone in your instance follow. In addition, there is the possibility of adding extra timelines for following a specific #hashtag. 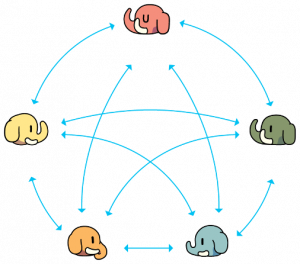 Mastodon is decentralized & open-source, organized around « instances » (a node) that federate in a huge network where people from every instance can communicate with each other (basically). The big difference with traditional social networks however is that it’s federated. The best known example of a federated network is probably email. Maybe you’ve joined Hotmail in the early days of the internet, but now you find that ProtonMail serves your needs better. In the case of email, you can simply switch. Okay, you’ll need to let everyone know that you’ve changed your mailadress, but you don’t lose contact with other people. If mail wasn’t federated, it would mean that you could only talk to people with Hotmail-addresses from a Hotmail account. This sounds crazy for email, yet, for social networks, this seems to be the norm. Mastodon being federated, this means that the social network doesn’t belong to one big company such as Twitter or Facebook. Actually, it is composed by many associations, communities and individuals who each have their own node of the network (i.e an instance). You can choose to join any instance among the 2000 already existing. Later, if you want to switch for another instance, you can! Mastodon is also a free/libre software. This means that everyone can use, share, study and improve the software. This ensures that developers can make their project able to talk with Mastodon and the federation. Such projects already exist, like GNU-Social, Plemora, and many others. The big advantage of this is that if the software doesn’t do as you want it, you can use another one which will better suits your needs. The same goes if your instance isn’t a place where you feel at home : there is probably someone who has had the same feeling and decided to create their own instance that you can join, without having to fear losing contact with all your friends. Finally, with the right skills, time and energy, it is also possible for you, your organization, your club, your friends… to create your own instance as well. We collected some documentation on our wiki to help installing a Mastodon instance. We explained all this last year when the Pirate Party of Belgium decided to install its own instance (fr, nl). Recent scandals around Facebook and Cambridge Analytica have shown that putting personal data in the hands of GAFAMs (Google, Apple, Facebook, Amazon and Microsoft) is extremely dangerous. As a reminder, Cambridge Analytica collected personal data from 87 million facebook users in order to influence the 2016 US elections in favor of Donald Trump. Everything suggests that this is only the tip of the iceberg and this kind of practice is a widely used business model. The manipulation of elections is only one of the dangers of data processing. As Edward Snowden’s revelations have shown, mass surveillance is a reality and our fundamental right to privacy is at risk, whether it is our own or that of our loved ones as well. It is therefore a necessity to regain control over our data. Initiatives like Mastodon, or more generally Framasoft’s De-google-ify internet campaign go in this direction, as does the KITTENS initiative. Opting for services that are more respectful of our rights also makes it possible to put pressure both on the corporations that exploit us so that they abandon these practices, and on political leaders whose proposals must take into account this collective awareness of our rights. At the moment of writing this article, there are 381 people registered on our instance. Your first impression might be : “Such a low number!”, if you compare it to the billions of Facebook users. But you’d miss the whole point : we’re one instance among 2.000 others. And our objective is to provide a place for people to express themselves in a friendly, engaged space. So we’re not growth-obsessed. Unfortunately, many of these 381 are very inactive, or even never posted. We don’t really know what causes this shyness. Maybe we need to be more proactive and welcome them in a specific way to facilitate their integration. If you’re one of these people, or if you plan to join our instance, please don’t hesitate to introduce yourself to the Mastodon-world! As explained above, people who register on our own instance can communicate with people registered on other instances. This has allowed us to have better and more cordial communication with organzations and activists because the environment incites such behaviour. Also, even if we’re still experimenting as we go, we can proudly say that the administration team behind our instance as provided us an instance that is technically very stable and quickly up-to-date. More instances : how wonderful would it be if each organization, each corporation, each community, each borough, each city… developped its own Mastodon instance? More diverse people : we’d appreciate if everyday people also joined. Currently Mastodon is a patchwork of geeks, activists, lgbt’s and artists. The tool Mastodon is very young, and will improve greatly thanks to everyone’s contribution. Besides, other parallel projects are being developped to be federated with Mastodon. Recently, we have seen the emergence of Peertube (an alternative to Youtube) for hosting videos in a federated way, and the social networks Pleroma and Aardwolf as well. In the futur, the music server Funkwhale should also join the federation. We can safely assume that over time, other projects will join the federation. And who knows? Maybe someday we will have similar alternatives to tumblr, forums, disqus, etc. The only limits are bound by our imagination. We thus invite you to join Mastodon. We recommand you to choose an instance that suits your needs and that is not too crowded. The PPBe instance is currently fitting perfectly for pirates who want a stable, peaceful place with cool people, where they can talk about anything. It’s also the perfect place to get in touch with pirates, or to get news from the PPBe. By using our instance, you would also help us to promote and support the Pirate Party. But we would be very happy to get to know you even if you decided to join one of the more than 2.000 instances around the world via joinmastodon.org.